Glencore and Evolution Mining have struck a deal for all of the gold and some of the copper produced at the Ernest Henry mine in northwest Queensland, Australia. For $A880 million and monthly installments equal to 30% of the mine’s production costs, Evolution purchased a 30% stake in the mine, which would entitle it to 100% of Ernest Henry’s payable gold production and 30% of its copper and silver production, subject to an agreed life of mine and block model. Glencore will purchase the copper and silver (in concentrate) delivered to Evolution for cash at market value. It owns Ernest Henry Mining Pty Ltd., which owns and operates the Ernest Henry mine. 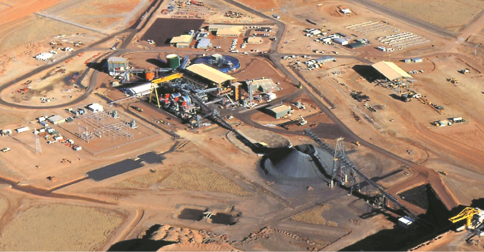 Glencore will continue to manage the day-to-day operations at the mine. Ernest Henry is one of the deepest copper and gold mines in Australia and it normally produces about 100 mt/y copper and 80,000 oz/y of gold. Ernest Henry’s copper-gold concentrate contains around 29% copper and 11 grams per metric ton (g/mt) of gold. Its concentrator has the capacity to produce 350,000 mt/y. Evolution Mining produced more than 803,000 oz from seven Australian gold mines at an all-in sustaining cost (AISC) of A$1,014 per ounce. The company recently sold its Pajingo mine and this move will add to its gold position and reduces its overall AISC. Evolution also announced that it has sold its Pajingo underground gold mine and surrounding exploration tenements in north Queensland to Minjar Gold for proceeds of up to A$52 million. The total consists of an A$42 million upfront cash payment and a 1% net smelter return royalty of up to A$10 million for gold production above 130,000 oz. The Pajingo mine is located 50 km south of Charters Towers, Queensland. The mine produced 68,630 oz of gold in Evolution’s fiscal year to June 30. Underground mining is based on modified Avoca and longhole open-stoping methods, with ore hauled to surface via decline. Ore is free milling and is treated on-site by conventional crush-grind-carbon in pulp processing to produce gold-silver doré. Minjar Gold is a wholly owned subsidiary of Shandong Tyan Home Co. Ltd., a publicly listed company that trades on the Shanghai Stock Exchange. The company owns the Minjar gold mine 550 km northeast of Perth, Western Australia. Minjar acquired the Minjar mine in 2009 and delineated a resource base to support recommencement of mining and milling operations in 2013. The operation produces approximately 35,000 oz/y of gold. In 2015, Minjar acquired the Kirkalocka gold project, 70 km south of Mount Magnet, Western Australia. The company is seeking to further grow its production profile with acquisitions within Australia. Following the sale of Pajingo, Evolution will operate six wholly owned gold mines in Australia: Cowal in New South Wales; Mount Carlton, Mount Rawdon, and Cracow, in Queensland; and Mungari and Edna May in Western Australia. In its fiscal year to June 30, Evolution produced 803,476 oz of gold at all-in sustaining costs of A$1,014/oz, generating a net mine cash flow of A$428.2 million. Following the sale of Pajingo, Evolution has revised its fiscal year 2017 gold production guidance to 745,000 oz to 800,000 oz at all-in sustaining costs of A$970 to A$1,030/oz. Evolution Mining’s purchase of a 30% stake in the mine, shown here, entitles it to 100% of payable gold production and 30% of copper and silver production, subject to certain stipulations regarding mine life, etc.